The material will have a major impact on the sound quality of your instrument. Look into the sketch/drawing of your instrument and start with a detailed list of all materials needed for your project. In some cases you have to decide “make or buy”. You can buy fretted fingerboards, or you can just order the wood. You can buy a bridge, or you can make your own bridge. 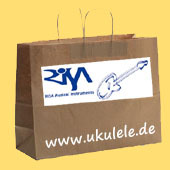 Several shops are specialized on luthier supply. You will find them by searching the Internet for terms like “guitar parts”, “luthier supply”, “tonewood” etc.